On a typical Sunday, you might here Tony Romo say “the offense is in 11 personnel here” or “watch them run the ball here in 21 personnel”. What Does 21 Personnel Mean? The two number system is used to identify the number of running backs and tight ends in the game. For instance, 21 personnel means 2 running backs and 1 tight end. Now we know that there is only 1 running back, it must mean there are 4 wide/slot receivers on the play. This knowledge helps defenses properly match up with offenses from a speed/power standpoint. 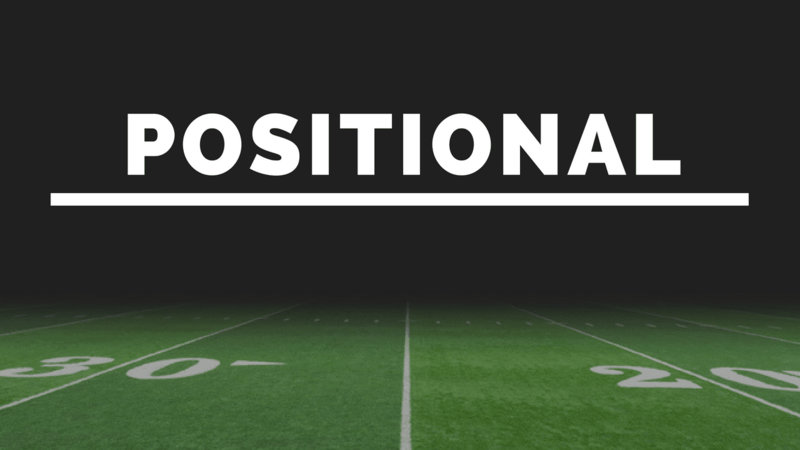 We’re going to break down the different types of formations that come with different personnel groupings. This will give you a clearer picture of what the offense is trying to accomplish when set in these personnel sets. 21 Personnel is a dying personnel grouping, especially in the NFL. With the innovation of the spread offense, fullbacks are not necessarily needed, thus eliminating the second running back. However, teams like Kansas City and New England both carry fullbacks which have proved to be a pivotal part of their offense, especially in short yardage situations. 22 Personnel is often used for short yardage situations, or with teams that have versatile H-backs in their system. A great example would be when the New England Patriots had Martellus Bennet and Rob Gronkowski on the field at the same time. Both players match up extremely well against linebackers, and have the capability to run block effectively. As mentioned, 22 personnel has 2 running backs, 2 tight ends and 1 receiver in the game. Due to the “bigger” personnel on the field, defenses are more apt to put bigger lineman on the field to match size for size. 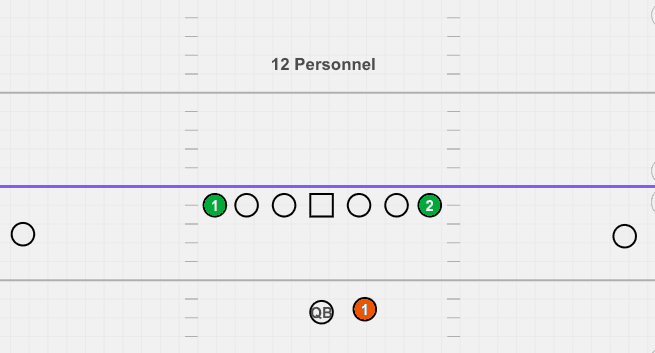 10 Personnel is common for team that spread the football around the field. As shown above, doubles and trips are common formations when in 10 personnel. Also, common run schemes of 10 personnel are inside and outside zone. Being in 10 personnel is a great way to utilize speed and athletes in space. It also forces the defense to spread themselves out, covering the box with less players. 11 personnel is more balanced for teams to both throw and run from. Teams are able to still run both inside/outside zone, as well as 21 personnel plays such as the power. It keeps offenses more balanced, as they’re forced to keep a linebacker on the field to match the power of the tight end. Using Rob Gronkowski as an example – he is a matchup nightmare for teams because they have to pick their poison of keeping a linebacker in the game (who is often too slow to run with him) or bringing in a defensive back to cover him (who is often not as good as a linebacker in the run game). The Patriots have been able to use 11 personnel to both run from spread and attack the middle of the field. 12 Personnel is slowly becoming the new 21 personnel for teams who want to run power football, but have two tight ends to spare rather than a stalky, physical fullback. Teams may elect to use two tight ends on the line of scrimmage, or one tight end on the line of scrimmage and the other as a motioning H-back. An example would be running power from 12 personnel, like we diagram here in our blog about the power play. 3 tight end’s are rare in high school and college football, however in the pro level it’s common. To stick with the New England Patriot theme, we’ll often see Rob Gronkowski, Dwayne Allen and Jacob Hollister line up as tight ends. Gronk will often line up as an H-back and motion back and forth, giving the flexibility to run power or any scheme, often from under center. Why Aren’t The Receivers Included In The Personnel Grouping? The personnel groupings only include running backs and tight ends. It makes it easier for defenses to identify by using these two positions, as stopping the run is most important to a defense’s personnel. What If There’s More Than 2 Running Backs? If there’s more than 2 running backs ( such as a wing T, which has 1 fullback and 2 wings), it all depends how the coach wants to classify it. Because those wings may turn into slot receivers, it may be worthy to categorize it as 10 personnel. If it’s a run dominate team, it can be classified as 31 or 32 personnel. It’s all at the coaches’ discretion. What’s The Best Way To Use The Personnel Grouping Numbers? The best way to utilize the personnel grouping numbers, is to determine which defense you should have on the field. Often times college or pro teams will have a flip board with “21” or “11” signaling to the defense who is in the game before the offense breaks the huddle. Certain formations often tip off tendencies of offenses.